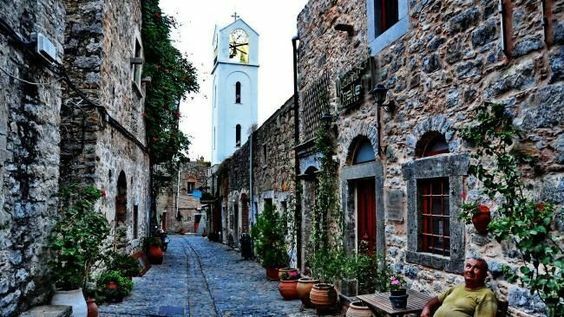 VESSA, one of the Medieval villages of Chios, in the centre of island, in distance 19 km of city Chios. The village took his name probably from the Homirian name [bissa]=[valey] and continuity [Vessa]. Vessa is a castle – village from 1450, with narrow, cobbled streets and intact medieval architecture. VESSA delimits the region of MASTICHOCHORIA, that is constituted by nine  villages: Elata, Lithi, Mesta, Olympi, Pyrgi, Armolia, Kalamoti, Patrika. Their common traits are their particular building web and the cultivation of the famous mastic tree, which grows only in this region of CHIOS. In small distance from the settlement are found the archaeological spaces, ANABATOS and NEW MONI, with the exceptional Byzantine mosaics of 12th century, an UNESCO wold heritage sit. In small distance from VESSA meets particular beaches, as the TIGANI – AGIA IRINI and DIDIMA westwards, and KOMI - EMPORIOS - BLACK VOLIA in the south.